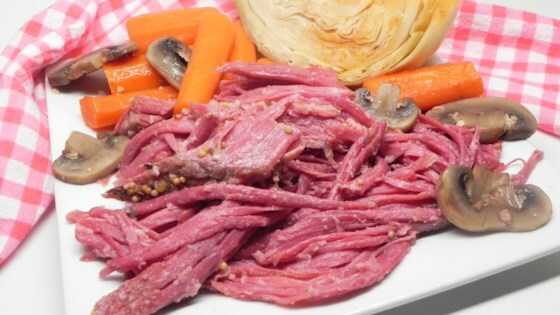 "Corned beef used to be a weekend only treat for me due to how long it took to cook, until I discovered the Instant Pot®. Save yourself time and hassle by letting your Instant Pot® do all of the work for you, and in a fraction of the time. You can have it and all of the fixings on your table in 2 hours. If you decide to fix cabbage, be sure to keep it in large wedges so that it does not overcook." Combine water, beer, and garlic in a multi-functional pressure cooker (such as Instant Pot(R)). Place trivet inside. Place brisket on the trivet and sprinkle spice packet on top. Close and lock the lid. Select high pressure according to manufacturer's instructions; set timer for 90 minutes. Allow 10 to 15 minutes for pressure to build. Release pressure carefully using the quick-release method according to manufacturer's instructions, about 5 minutes. Unlock and remove the lid. Transfer brisket to a baking sheet, cover with aluminum foil, and let rest for 15 minutes. My kids and my husband like my slow cooker version much better. Won’t use this recipe again.